Step 2 In a small bowl, mix the spices. Pat the chicken thighs dry, and season each thigh on both sides with the spice mix. Be sure to season underneath the skin as well. Let the chicken thighs sit in room temperature for about 15 minutes. Step 3 When ready, heat 1-2 tbsp of olive oil in a cast iron skillet with a lid like this one. Brown the chicken thighs deeply on both sides in the heated oil. Remove from skillet and set aside briefly. Step 4 Lower the heat and deglaze the skillet with the white wine. Let cook to reduce and then add the broth. Step 5 Bring the liquid to a simmer then add lime juice and garlic. Step 6 Now return the chicken to the skillet; and toss in the cilantro. Bring to a high-simmer for about 5 minutes or so. Step 7 Cover and transfer to the 375 degree F-heated oven for 45 minutes or until chicken is cooked through. Step 8 Remove from the oven and let sit for 5 minutes before serving. Garnish with more cilantro, if you like. Step 9 A simple fattoush salad and a side of rice, couscous or Greek potatoes complete this chicken dinner. 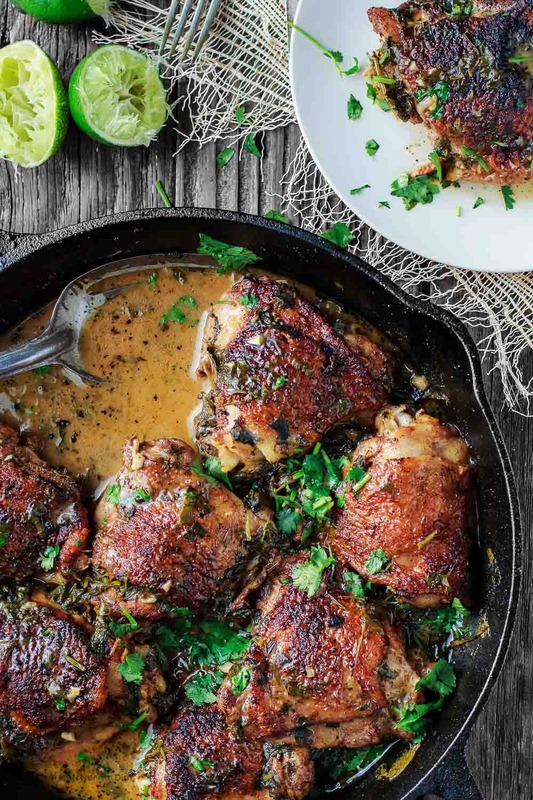 This “saucy” cilantro lime chicken takes on a delicious Mediterranean twist with a special spice mix and a zesty, garlicy sauce. Word to the wise, make every use of the tasty sauce!